Have an office set-up and ready to start plugging in? 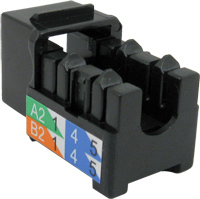 Before you do that, check out V-Max RJ45 90° 8x8 Cat6 data grade keystone u-jacks. Easy to install, the jacks snap on to a variety of wall plates, surface mount boxes, and patch panels that are keystone compatible. Category 6 is the common standard for Ethernet networks, but can work with slower cables such as Cat5 and Cat3. 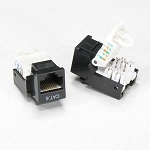 If you’re looking for a fast and reliable connection, then this may be the product for you. Built tough and transmitting frequencies up to 250MHz, 90° Cat6 jacks are compliant with TIA/EIA-568A/B structured cabling standards. Implemented in commercial buildings and campus environments, Cat 6 keystone u-jacks are surveyed and tested to make sure they are safe to use; the RJ45 jacks are approved with a 94V-0 rating, and constructed out of flame retardant materials such as self-extinguishing plastic. 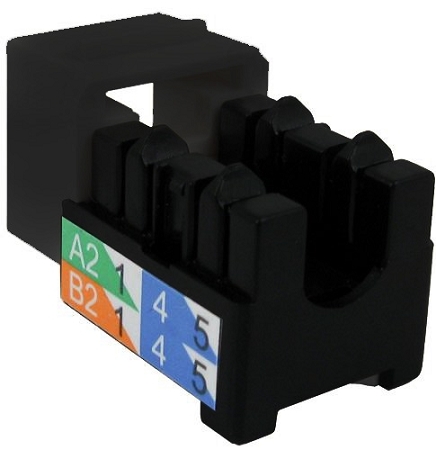 50µ”conductors inside each V-Max jack are made of gold plated brass and connect to a double-sided printed circuit board (PCB), supporting electronic components via conductive pathways etched into the contacts. 8x8 means that you can customize the set-up of your wires for voice and data applications. 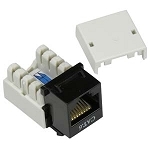 8P8C connectors are used with a variety of telecommunication systems such as networks that have switches and routers. This is beneficial for business buildings and college campuses with complicated cable and Ethernet systems like local area networks (LANs) and business servers. Your office solution is only a click away. Please click the "More Information" tab for specifications and dimensions.